Bo Mason, his wife, Elsa, and their two boys live a transient life of poverty and despair. Drifting from town to town and from state to state, the violent, ruthless Bo seeks out his fortune - in the hotel business, in new farmland and eventually, in illegal rum-running through the treacherous back roads of the American Northwest. 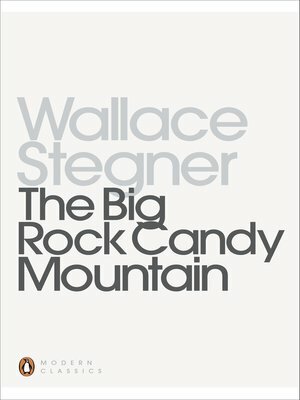 In this affecting narrative, Wallace Stegner portrays more than thirty years in the life of the Mason family as they struggle to survive during the lean years of the early twentieth century. Wallace Stegner was the author of, among other works of fiction, Remembering Laughter (1973); Joe Hill (1950); All the Little Live Things (1967, Commonwealth Club Gold Medal); A Shooting Star (1961); Angle of Repose (1971, Pulitzer Prize); The Spectator Bird (1976, National Book Award); Recapitulation (1979); Crossing to Safety (1987); and Collected Stories (1990). His nonfiction includes Beyond the Hundredth Meridian (1954); Wolf Willow (1963); The Sound of Mountain Water (essays, 1969); The Uneasy Chair: A Biography of Bernard deVoto (1964); American Places (with Page Stegner, 1981); and Where the Bluebird Sings to the Lemonade Springs: Living and Writing in the West (1992). Three short stories have won O.Henry prizes, and in 1980 he received the Robert Kirsch Award from the Los Angeles Times for his lifetime literary achievements.